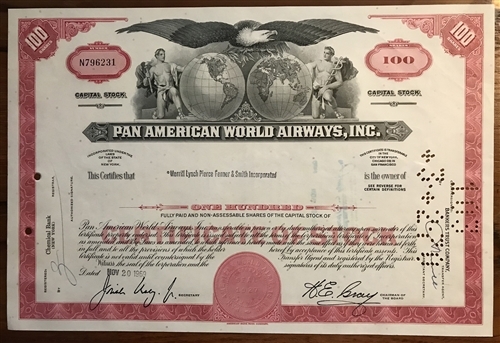 Pan American Airways red stock certificate issued during the 1960's to 1980's. Beautiful engraved certificate by the American Bank Note Company showing a vignette with a double globe topped by a large eagle. Very good condition with the usual folds, punch cancellation, staple holes, and written numbers. 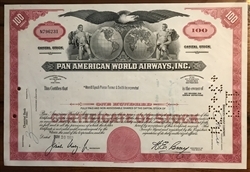 The certificate shown is similar to the one being offered for sale with the exception of dates, owner, officers, bank/redemption info, etc. Super collectible of a great pioneering airline.